Chennai is the hub for the entertainment industry in Tamil Nadu. The city is also the one that introduces new things in terms of business, fashion, entertainment etc. One such is the event management services. Today, almost everyone wants to throw a glitch free party or event. Planning such events is no easy task. When the guest list is huge, it is advisable to go with an experienced event management service provider. 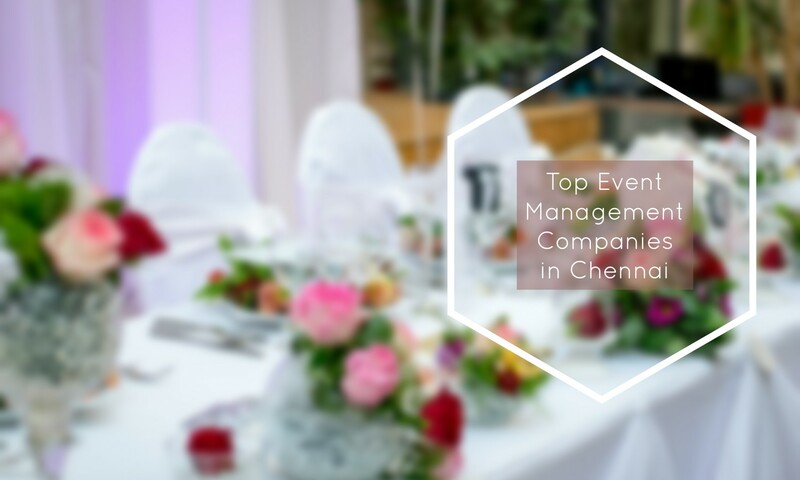 List of Top 10 event management companies in Chennai are as below. The company provides end to end solutions for all your event management needs. Headed by an experienced businessman and a strong team, the company has grown famous in just 3 years after it was established. The company’s client portfolio includes TCS, Volvo ex con, Cosmopolitan club, Annamalai university, HCL, Baxter, Siemens, Hero Honda, Coca Cola, Mc Donalds, Infosys and many more. It is one of the popular event management companies in Chennai. Services: Product launches, corporate anniversary parties, meetings, conferences, marketing programs, press conferences, road shows, grand opening events, concerts, award ceremonies, commercial events, fashion shows, religious services, fund raisers, artist intouch, theme parties, adventure sports, private events and wedding planners. Showman Entertainment Private Ltd was established in the year 2005 offering event management services to individuals and corporate. The company assures end to end services within budget and on time. It is one of the best event management companies in Chennai. Services: Exhibitions, Product launch, conference, Inauguration, Promotion, Merchandising, Press meet and Special event. Renaissance Event Management Company is famous for its unique concepts and designing of events. It is one of the top 10 event management companies in Chennai. The company manages all aspects in event management right from invitations, accommodation, transportation, venue rentals, rehearsal costs, food, beverage, floral arrangements, décor, music, entertainment, speakers, staging, insurance, gifts, power charges, staffing, customs to security and much more. Services: Roadshows, Exhibitions, New product launch, advertising, ideation, seminars, conferences, sounds & lights, animation, non-stop creativity, celebrity management, event management and wedding management. Carrot ad works belongs to Star Four Group and was established in the year 2008. The company offers end to end event management services and works alongside of Nakshatra Foods. Its clients include Accenture, Club Mahindra, State bank of India, Standard Chartered, Vodafone, TTK, star tours, L&T, TCS, Docomo and many others. Services: Meetings, incentive programs, conventions, exhibitions, product promotions, brand promotions, road shows, entertainment shows, concerts, weddings, anniversaries, birthdays and creative designing for ad films, corporate films, logo designing, caricatures, event collaterals etc. Red chariots were founded in the year 1998 and is one of the leading event management service company in Chennai. Its client portfolio includes corporate giants like Brittania, Vodafone, Coca cola, Wipro, Dabur, Intel, Unilever, GSK, CavinKare, Hero Honda, Kingfisher, Airtel and many others. Services: Event management, rural marketing, Masala kart, Spatial design and brand activation. Primus Indtech private limited is an integrated marketing and event management company with its offices in Bangalore, Cochin, Chennai and Hyderabad. The company organizes both domestic and international events for individuals, small, medium and large companies. Services: Advertising, promotions, events, conferences, exhibitions, interiors, wedding planners, seminars, live entertainments, road shows, mall activation, fashion shows, product launches, promotions, web designing, model shoots, press releases, banners etc. IMI promos & events is one of the leading event management companies in Chennai focusing on delivering services like road shows, The company’s clients include Sharp, Purvankara, Dulux, India today, The times of IndiaTrigger, Nippon paints, Suzuki, kotak and many others. Services: Workshops, conferences, sports events, corporate outings, party, exhibitions, MICE program, annual day meets, theme parties, dealers meet, team building activities, celebrity management, product launches and wedding events. Elite Eventz was established in the year 2008 as an event management service provider. Its client database includes HDFC bank, UHMS, CPCL, Dhalaxmi bank, CPAT-TVS, Smot school and many more. The company provides services to people and companies all over Tamil Nadu. It provides cost effective event management with specialized vendors and staff. It is one of the preferred event management companies in Chennai. Services: Product launch, fashion shows, exhibitions, conferences, corporate events, theme parties, promotions and sporting events. Fun designers are a one stop solution for all your event management needs. The company delivers budget friendly, organized and on time event management. It has branch offices in Coimbatore, Mumbai, Bangalore, Pondicherry and Hyderabad. Services: Stage shows, music shows, live concerts, dance shows, leisure sports, cultural events, wedding events, birthdays, anniversaries, product launches, road shows, international seminars, theme party, dealer meets, annual day celebrations, award ceremonies, celebrity shows and many more. Team and Trade expos is a famous exhibition and event management company in Chennai. The company specializes in end to end organizing of trade exhibitions including venue booking, on site staffing & badging, sponsorship, brand promotion, exhibitions sales & management and merchandize management. Services: Exhibition organizing services, exhibition management services, event management services, exhibition booth services, conference planning services, visitor registration services, product launching services, outdoor promotion services, brand promotion services, events and fashion shows. Hope you find the list of top 10 Event companies in Chennai useful for you to take care of your events. Please let us know if you know any other good event management company is Chennai, we are glad to add them in our list.